The 1979 Tampa Bay Buccaneers – The Forgotten Worst-To-First NFL Season. When television viewers in the UK starting following the NFL in 1982 on Channel 4, the Tampa Bay Buccaneers had ended the season by qualifying for the playoffs off the back of a 5-4 record in the strike–shortened regular season. This was the high point for the Buccaneers as far as UK fans were concerned as they went on to pitch losing season after losing season for the next fifteen years, interspersed with brief moments of promise that seemed to fade as quickly as it had come. That 1982 team was really the battered remains of a Tampa Bay team that (including 1982) had made the playoff three times in the last four seasons, even making the NFC Championship game once. However this team is largely forgotten about, on both sides of the Atlantic, arguably because they were so bad before the magic four year period between 1979-1982, and they were so terribly bad after it. The Tampa Bay Buccaneers began life in the NFL in 1976 and promptly lost their first twenty-six games over their first two seasons before finally recording their first ever victory in the second to last game of the 1977 campaign with a 33-14 victory over the embarrassed New Orleans Saints. They also won the following week 17-7 at home over the St. Louis Cardinals, stretching their winning streak to two and ending the year 2-12. 1978 showed more modest steps as they improved to 5-11. They had actually stood at 4-4 at the halfway point of the season, but had collapsed somewhat losing seven of their last eight contests, including four straight defeats to end the season. However, in 1979 things were different from the off. Before we look at that "turnaround season" however, check out the short video below which features footage from the Buccaneers first ever training camp in the summer of 1976. The Buccaneers even made the cover of Sports Illustrated in October 1979. RB Ricky Bell had his best NFL season in 1979. They began the season 5-0 and were the NFL’s last unbeaten team before losing their first contest 17-14 to the New York Giants in the sixth week of the year. They were even put on the cover of Sports Illustrated as the country started to pay attention to the NFL’s newest addition. After twelve games they stood at 9-3 and looked poised to ease into the post-season for the first time in their short history. They had a hard-hitting defense led by Lee Roy Selmon and were suddenly one of the better units in the NFL. Doug Williams had also continued to build on the promise he had shown as a rookie. He was a tough-nosed quarterback with a canon of an arm and was clearly the leader of the offensive unit. They also had Ricky Bell coming out of the backfield. They had drafted Bell with the their first pick of the 1977 NFL draft and now in his third season he would enjoy his finest campaign in an all too short NFL career as he notched up 1,263 yards on the ground. However going into the final quarter of the regular season the Buccaneers began a three-game losing streak as they fell to the Vikings (23-22) and the Bears (14-0) at home before losing to the lowly San Francisco 49ers (23-7) who had only won a single game all season. After fifteen games the Buccaneers were now 9-6 and had to win their final game in order to make the playoffs. There were concerns that the Buccaneers, who were a very young team, might lack the experience needed to clinch that all important win to make the playoffs. Lee Roy Selmon compared it to how it felt in the run up to the team winning it’s very first game when speaking to the media. The final game of the Buccaneers 1979 regular season was played in a torrential downpour. The final game of the regular season saw the Kansas City Chiefs travel to Tampa. In a contest that was played in “biblical” weather under a torrential downpour and dark rolling skies, the Buccaneers eventually booted through a 26-yard field goal late in the final quarter to seal a 3-0 victory. Incidentally the victory was also the first shutout in team history and earned the Buccaneers the NFC Central championship and a place in the playoffs. They welcomed the Philadelphia Eagles in the Divisional round of the playoffs two weeks later, who were coming off a tough 27-17 wild card win over the Chicago Bears the week before. Ricky Bell had a fantastic day for the Buccaneers as he ran the ball 38 times for 142 yards and also scored two touchdowns. Tampa Bay took a 17-7 lead over Philadelphia (themselves only a year away from a Super Bowl appearance) and went on to hold off the Eagles 24-17. They were now on their way to the NFC Championship game – or more to the point, the NFC Championship game was on it’s way to Tampa. The Buccaneers defense was one of the leagues best in 1979. Due to the Los Angeles Rams surprising the Cowboys and knocking the defending NFC champions out of the playoffs, the 1979 NFC Championship game would be played at Tampa Stadium. The Buccaneers, losers of their first twenty-six NFL games were now sixty minutes away from the Super Bowl. Now the commentators for the game were Pat Summerall and Tom Brookshier, the best that CBS had to offer. Both admitted during the pre-game broadcast that neither of them expected to be sat in Tampa Stadium for the NFC Championship game, yet here they were. The Rams were a beaten up team, with at least one of their players literally playing on one leg, as Jack Youngblood played the game with a hairline fracture in his leg. In fact their starting quarterback, Vince Ferragamo was only in the line-up due to the original starter, Pat Haden being injured. However by the games end, the Buccaneers had not only been beaten on the scoreboard, they had lost several key players to injuries, not least of which was quarterback, Doug Williams. By halftime it was only 6-0 on the scoreboard but in reality, as much of a defensive struggle as it was, the Rams had dominated the contest. By games end, they had shut-out the home team Buccaneers 9-0. Between them Doug Williams and back-up signal caller Mike Rae completed only four of their twenty-six pass attempts. It had been a valiant season and a valiant effort, but they had fallen just a little short. A long way from their 0-26 start though. The future looked bright for the young Buccaneers. The Los Angles Rams proved too much for the Buccaneers 9-0 in the 1979 NFC Championship game. The following season in 1980, despite winning their first two contests over the Bengals and the Rams respectively a rash of injuries began to mount, especially on defense and the magic that had engulfed the team the season before didn’t seem to be there now. After nine games though, and in part due to the overall weakness of the NFC Central that year, the Buccaneers were still in the playoff race with a 3-5-1 record. However, similar to 1978, the Buccaneers lost 6 of their last seven games and finished tied for last in the division with a 5-10-1 mark. The NFC Central was much the same the following season in 1981, and again the Buccaneers were sat at an unflattering 4-4 mark halfway through the year. This time though, sparked by a week twelve 37-3 hammering of the Green Bay Packers, the Buccaneers won four of the last five games to win the NFC Central for the second time in three years, and make the playoffs again. Doug Williams was the team's MVP and was only the second active quarterback to pass the career 10,000 yard passing mark in only four seasons. However in the Divisional round of the playoffs against the Dallas Cowboys, Williams was intercepted four times and pressured throughout a lopsided 38-0 pounding in Texas Stadium. Williams again led the Buccaneers to the playoffs in the strike-shortened 1982 campaign (the third time in four years he had done so) but they again fell at the first playoff hurdle, again to Dallas, this time 30-17. 1982 was Williams' last season in Tampa Bay. He was at the time one of the lowest paid starting quarterbacks in the NFL, and considering that he had just led the team to it’s only three playoff seasons and had done so in the last four years, he felt he was entitled to a considerable pay rise. QB Doug Williams took the Buccaneers to the playoffs three times in four years from 1979 to 1982. It is said that Williams asked to paid around $600,000 per year but owner Hugh Culverhouse would only stretch to $400,000, which while a big increase from the previous salary, would still leave Williams one of the lowest paid starting quarterbacks in the NFL. He speculated, and some agreed, that the reason was because he was black. Williams opted to sign with the Oklahoma Outlaws of the USFL, and eventually returned to the NFL in 1986 as a back-up with the Washington Redskins. 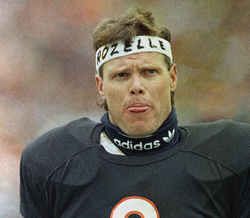 The following season however, he would lead the Redskins to Super Bowl XXII and have arguably the greatest single quarter in Super Bowl history, earning the MVP award for the game as the Redskins destroyed the Denver Broncos 42-10. Ricky Bell was traded to the San Diego Chargers following the 1981 season and retired from football a year later. The one-time shining light and future of the Buccaneers, tragically died of heart failure due to dermatomyositis on 28th November 1984. He was only twenty-nine years old. The film, A Triumph of the Heart: The Ricky Bell Story was based on his life, and if you can get a copy, is worth watching. The Buccaneers meanwhile would finish with a miserable 2-14 record three of the next four seasons, with 1984 yielding a total of six regular season wins, which would be most amount of wins the team would manage in any one season until 1995, when they managed seven. Check out the videos below. They look at the John McKay, the head coach who guided those early Tampa Bay Buccaneers' teams. 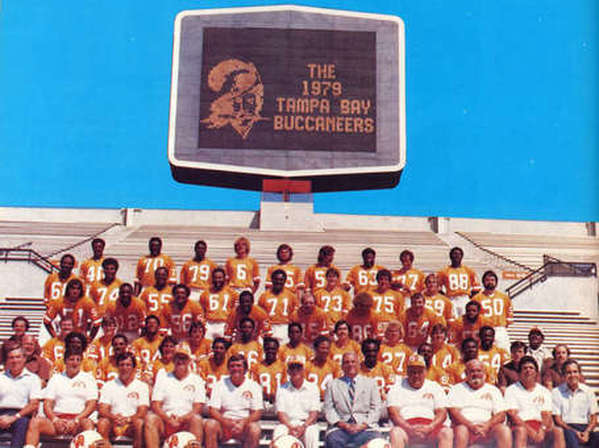 The 1979 Tampa Bay Buccaneers - the first Buccaneer team to make the playoffs and the NFC Championship game.